Laurence Maguire and Jake Beesley have been offered professional contracts to remain at Chesterfield. 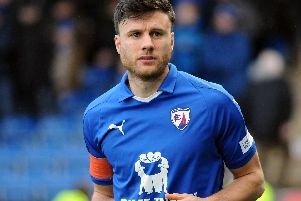 Maguire, a central defender, and striker Beesley, who has 20 goals for the season so far, have both played for the Spireites’ youth team under Mark Smith. Both youngsters have a footballing heritage. Maguire’s brother Harry is with Premier League club Hull City and Beesley’s father, Paul, starred for the likes of Sheffield United and Leeds United. Academy manager Gerry Carr said: “This is without doubt the most difficult part of my job. We have had an excellent season with the youth team and all of the players have played a huge part in that. “Mark Smith and I have assessed all of the second years over a two-year period and Laurence Maguire and Jake Beesley have been the most progressive over that period. “Hopefully they can both go on to represent Chesterfield in the first team. For those two the hard work to become a successful professional footballer is just starting. “Those that have been unfortunate enough not to be offered a professional contract will hopefully go on to prove us wrong.